Modern cottage on peaceful, small lake in Southern New Hampshire. Home is ideally located only 32 miles from downtown Boston, one hour to ocean beaches and 90 minutes to the heart of the White Mountains. Excellent for swimming, kayaking, paddleboarding and fishing. No motors allowed on the pond makes this an ideal quiet, summer getaway. The home features a master bedroom with a king sized bed and a large loft with a full sized and twin bed. A/C, TV, cable, internet and WiFi included. Outside deck features small table for quiet lunch for 2 or 4, and a large picnic table that seats 10, perfect for outdoor grilling. Adjacent to 55 acres of conservation land, wonderful walking trails are right outside your door. Enjoy the "treehouse" setting - lakefront with beautiful sunsets. Paper towel, dish soap & sponges, food storage products, S&P, some spices, bottled water in the frig, coffee pods for the kuerig. Kitchen includes full size refrigerator, electric stove, dishwasher, microwave, toaster oven, keurig, electric tea pot, fully stocked pots, pans, dishes. Full size dining table inside seats 6. Beautiful redwood picnic table outside seats 10. Diane and Alan went out of their way to send us information about places we were interested in. We loved your suggestions on hikes in the White Mountains and especially Ogunquit. We very much enjoyed our stay in your cottage. The sunsets were amazing. Your hospitality was very much appreciated. The kayaks were an extra bonus. Thank you for sharing with us. LOOK NO FURTHER ! THIS IS IT! Phenomenal Owners, Gorgeous Views, very comfortable home and toys to enjoy the area! - Highly recommend - actually just telling you... This is the place you need to stay if you care to enjoy your trip! What an amazing property and an amazing hostess! The home is beautiful, quiet, and perfect for a lazy kayak around the pond (my daughter says lake) and sitting and enjoying nature. The chipmunks peaked at us from the rock wall down to the pond, and dinner could be enjoyed indoors or out with a gorgeous view. It was also the perfect distance from the gymnastics camp we attended to return in the evenings and relax. I recommend the home and the hostess is a delight. Thank you for letting us enjoy your home! Almost too sweet to share! What a delightful surprise awaited us, on quiet Rock Pond, a scant hour from Boston. I must say I had my fingers crossed, as Southern NH has become far more about commuting than destination. But Diane has shared an absolutely lovely modern cottage that graces the treetops and looks down on a sweet, motor free pond that invites swimming and paddling and simply enjoying the play of light on the water at any time of day. If your family needs a few more thrills, Canobie Lake is about 15 minutes away! Diane was a very gracious host. The cottage was easy to get to from the highway. If you need to get groceries, there's plenty of stores within 10-15mins drive. Place is immaculately clean, very spacious with a well stocked kitchen with all the amenities of a full time home. It is located right on the water, with great access to swimming and fishing. There are 2 kayaks, and a canoe, but my wife and I just used the kayaks. Very easy to get in and out of the water on your own. We were here for a 3 day stay and it was perfect. If you like bass fishing this place is perfect. I caught 10 bass and 2 perch in 2 hours out of the kayak. For a smaller pond, the fishing was really impressive and fun. They have an outdoor fire sconce for evening fires. 10/10, would definitely rent again. 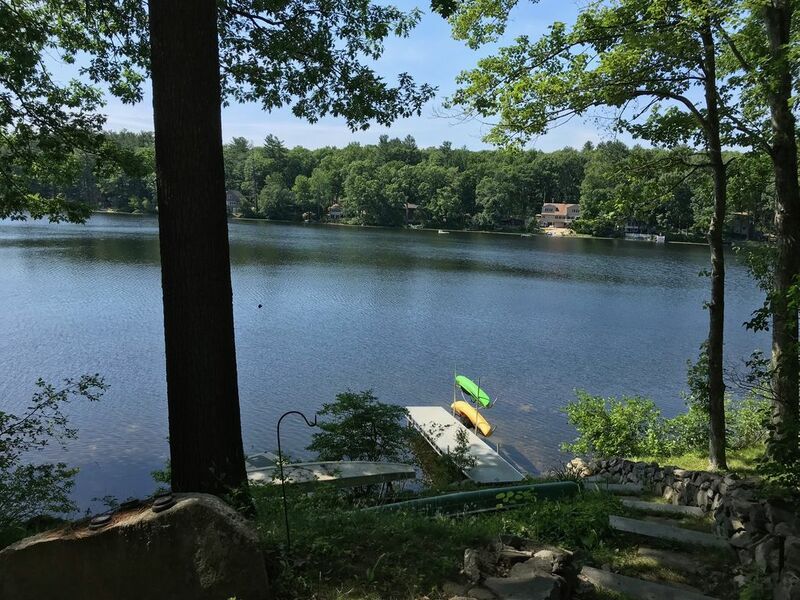 Our peaceful place on the pond is less than an hour away from Boston and the ocean - and just over an hour to the mountains - something for everyone.